This is one of those week's where all the interesting comics-y things I have for you fall into the 'other stuff' category. As always, I blame Loki. On the James Gunn controversy, which I first talked about a few weeks ago, FBE has a 'College Kids React' vid about all the goings on. Quick recap: James Gunn is the Guardians of the Galaxy director who was fired for tweets he sent many years ago. The whole thing is a lot more complex than it appears on the surface. It's interesting to see some different points of view on this, even if I don't agree with some of them. What did annoy me though is that the large political element of Gunn's fall from grace was largely glossed over in this video. Dave Bautista, who plays Drax, has threatened to pull out of the Guardians of the Galaxy series altogether if Gunn's script for GotG 3 isn't used. Honestly, I think they probably will use the script, simply because it would delay production too much to change it now. DC pulled a re-print of a classic Shazam collection this week. They, um... may have forgotten how racist early issues of Captain Marvel (Shazam's name before confusing copyright issues with Marvel's Captain Marvel,) were. And with the new Shazam film coming out soon, they didn't want to give the impression that this is what Shazam is about in the present day - this was meant to be purely an archive collection, but clearly the timing was way off publicity-wise. 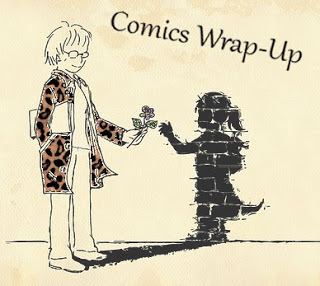 And to finish us off this week, here's a review of graphic memoir Lightness by Catherine Meurisse, from Stephanie Jane @ Literary Flits. Ugh I don’t know what to believe in the James Gunn situation anymore! I finally saw the tweets that got him fired, and they were EXTREMELY disturbing, and very disappointing. At the same time though I think he has truly learnt from his mistakes and if he wants to become a better person, shouldn’t we let him? Are second chances allowed here? I think the tweets themselves are indefensible. But he himself totally agrees with that, has apologised, and has actually said that he has no-one to blame but himself. He has not attempted at any point to defend what he said... and I think that says a lot about who he is today. Plus everyone keeps forgetting that the people who brought this up would have found *something* against him, and the fact that they had to go so far back also says something, I think. So true - his tweets were well out of order. But this wasn't something he did *after* starting work for Disney, but before. It's a pretty frustrating situation.